Media in recent months had given wide publicity and made the public knowledgeable about the first Buddhist school in Sri Lanka — G/Piyaratana Maha Vidyalaya, located between 64 and 65 mile post along Galle — Colombo main road in the Southern Province. It was highlighted in both the printed and electronic media that this school is heading towards rapid deterioration and possible collapse if it goes unattended by the relevant educational authorities and the public. It may be of historical interests for many Sri Lankans, particularly the Buddhists living here and abroad to know about the pioneering role played by this school, and the pioneering efforts made by the founder of this school in promoting native (national) education in Sri Lanka. Historical records speaks more on the valiant and charismatic role played by Piyaratana Tissa Nayaka Thero — the founder of this Buddhist school — who challenged missionary education in Ceylon under British rule. The significance of this challenge was that it was the first ever attempt to revive Buddhism through the promotion of native Buddhist education subsequent to the victorious great religious debate known as Panaduravadaya (Debate held in Panadura). The saga of this school goes as far back as 1869. That was the time when missionary schools and the government authorities did everything possible to suppress Buddhism and the setting up of native schools. Archival records in the National Archives in Sri Lanka and the collection of historical records still preserved by Sailabimbaramaya of Dodanduwa the abode of Piyaratana Tissa Nayaka Thero and also at Kumarakande Mahaviharaya (Dodanduwa) authoritatively suggest that Piyaratana Tissa Nayaka Thero was the founding father of Buddhist education in Sri Lanka. This fact was accepted when the Postal Dept. of Sri Lanka issued a commemorative stamp valued sixty cents in honour of this priest on 22nd May 1984. 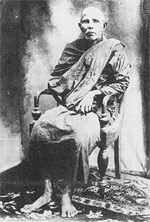 Although we identify the first Buddhist school as Piyaratana Vidyalaya, was initially known as Jinalabdhivishodhana (in love of Buddha) and the latter name replaced after the demise of Piyaratana Thero by his pupil, Siridhamma Thero, the immediate successor and the chief incumbent of the Temple. Historical documents further indicates that Piyaratana Tissa Thero through a society known as Lokartha Sadhana Sanagamaya, founded by himself engaged in a valiant battle to get his school registered with the then educational authorities under colonial government. Failing in his efforts to get it registered, he seemed to have used his tact and intellectual skills by giving a grand welcome to Governor Robinson by erecting pandals, when the latter visited Dodanduwa in an official tour in the Southern Province. In the same year he won his battle in getting this school registered with the educational authorities. That was in 1874 and it was a monumental task done by Piyaratana Nayaka Thero for the promotion of native Buddhist education in Sri Lanka. His contributions to promote Sinhala Buddhist education, of course need further research and it is unfortunate that his role is shrouded in the history of Buddhist revival, perhaps on account of the pre-eminence given to other contemporaries of his era by historians. It is not intended here to make a detailed historical sketch of his contributions except stating certain facts about him and the significant role played by this school during the pre and post — independence era. Historical records indicate that many leaders during the period of Buddhist revival had worked with Piyaratana Nayaka Thero and visited dhamsabha Mandapa of Sailabimbaramaya where many discussions were held on matters pertaining to Buddhist education. Veteran Buddhist priests like Hikkaduwe Sri Sumangala and Migettuwatte Gunananda (the chief debater of Panadurawadaya) and clergymen like Anagarika Dhammapala and Henry Steel Olcott were among the close associates of this Thero, with whom they exchanged letters on various topics in addition to their visit to this temple located adjacent to this school. Henry Olcott, an American national who formed the Theosophical Society and helped in promoting Buddhist native schools like Mahinda College in Galle, Ananda and Nalanda Colleges in Colombo and Dharmaraja College in Kandy and schools in other parts of the island was first administered pansil by Piyaratana Nayake Thero. Impressed by the activities of the thero, Olcott has contributed much needed financial assistance and laboratory equipments to this school including 8 mm projector, the first of its kind brought to the island (which is now in the possession of an outsider and worthy of preserving it as cultural heritage of Buddhist revival). It is also recorded in the archival records that the famous poet priest of Tibetan origin — Rev. S. Mahinda — was ordained by the same priest at Sailabimbaramaya. Another matter of historical importance is that the said temple is having a Buddha statute made out of rock which had been ferried through sea from Kaveri Pattanam of South India. As children we heard from our grand parents that the statute was brought to the temple by cutting a temporary canal from the sea coast leading to the temple bordering on the land side of the present railway track near Dodanduwa Railway station. It is well known that this priest was behind this Herculean task. (It is of historical interests to note that Dodanduwa was a hub of commercial activities during this period with linkages to South India from where salted fish (jadi in Sinhala) and Calicut tiles were brought through Customs located near Dodanduwa Road bridge. And also it had linkages with the Maldives and Singapore. Historical records in the possession of late Rev. Dhammasena of Kumarakande maha viharaya gives a vivid account of the commercial activities engaged by the sea-faring heroic people of this area). The efforts launched by Piyaratana Thero to promote native Buddhist education was unlimited. Accordingly it is known that it was this thero who took pains to introduce English medium stream to the school which was started in a temporary cadjan shed. The aim was to make students prepare for government jobs particularly make them compete with students passing out from English missionary schools. The reason why I am writing this is to draw attention not only to the past students of this school but also to their children and grand children to make them proud of the type of education served by this school. And also to remind the need for compulsory obligations to extend help to help recover from its present position. Above all, I want to draw public attention, particularly of those Buddhist high priests living here — Colombo, Kandy, Anuradhapura and foreign capital cities like London, New York, Washington, Tokyo, Toronto, Singapore etc. Also I wish to draw the attention of the Buddhist Philanthropists living all over the world. My objective in providing this article is two fold. Fist to emphasize the significance of preserving the first Buddhist school in Sri Lanka; second, to make an open appeal to the government, general public and the affluent Buddhists and all others concerned to promote this school either by funding or through any other means. My appeal in directed mainly to the Minister of Cultural Heritage — Vijitha Herath and Her Excellency, the Prime Minister, Minister of Education, relevant authorities of provincial education and all parliamentarians and the Opposition to help preserve this school as a place of "Cultural Heritage". Because this school is more than 130 years that is 30 years more than what is required to declare this school as an institution of cultural heritage... In this connection I draw the attention of the Commissioner of Archaeoloy to take all possible measures to preserve the cultural identity of this school and the temple where Piyaratana Thero lived. Subsequent to media reports an ad-hoc committee was established by a few old boys a couple of months ago when I was elected as the pro-tem treasurer. A full session of the Old Boys and Girls has now been summoned for today by extending an open invitation through public media to all the former students of this historic school. This meeting will commence at 9 a.m. and it is hopeful of establishing a steering committee for fund raising and mapping out future strategies to overcome the present debacle of the first Buddhist school. Any funding by philanthropists or well wishers within and outside the country may be drawn in favour of the Treasurer, Piyaratana Old Boys and Girls Association and addressed to the Principal, Piyaratana Vidyalaya, Dodanduwa.